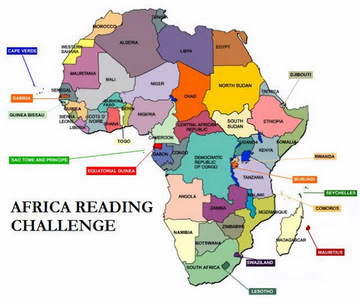 Welcome to the Africa Reading Challenge. I have absolutely no reason for hosting nor urging you to participate in this challenge save for the joy of discovering and reading African literature! The entire African continent, including its island-states, which are often overlooked. Please refer to this Wikipedia “list of sovereign states and dependent territories in Africa”. Pre-colonial empires and regions are also included. 5 books. That’s it. There will be no other levels. Of course, participants are encouraged to read more than 5 books. Eligible books include those which are written by African writers, or take place in Africa, or are concerned with Africans and with historical and contemporary African issues. Note that at least 3 books must be written by African writers. Fiction – novels, short stories, poetry, drama, children’s books. Note: You can choose to read a number of individual and uncollected short stories. In this case, 12 such stories would constitute 1 book. Individual poems do not count but books of poetry do. For the advanced reader of African literature: perhaps there is some gap (country, region, language, theme, gender) you want to fill or author(s) whose works you want to explore further? Read wherever the urge takes you! My suggestions notwithstanding, the most important thing is to have fun and to explore Africa through books. Overlap with other challenges is allowed. E-books and audio books are allowed. There is no need to make a list beforehand. Although most of us love lists, don’t we? For those with blogs: write a post on your blog about the challenge (with or without your list) and sign-up with the Mr Linky below using the direct URL of your sign-up post. For those without blogs: you can sign-up with your social media profile (Twitter, YouTube, Goodreads, Facebook or Shelfari). Please make sure to use the URL of your profile page. Alternatively, you can leave a comment indicating your intention to participate. Reviews of books read are not required but are encouraged especially for those with blogs. Please share your reviews with the rest of community the on Reviews Page. If you do not have a blog and would like to guest review on this blog, then please feel free to contact me. Likewise, completion posts are encouraged and you can share those on the Completion Page. Some classic African literature can be hard to find. Please check your libraries and use inter-library loans if you have access to such services. You will be able to do this challenge with the books currently available on the market. I will publish lists of reading materials under various themes every Friday until I tire of the process. Please contact me at kinnareadsATgmailDOTcom if you need any help. Ghanaian Literature Week – I have hosted this event for the past two years. This year, I will move it up from November to probably August (pending an announcement). So you could save your GhanaLit reads for then. A new reading event – I’m toying with the idea of a South African Lit week or month. I will decide soonest and let everyone know. Or if anyone is interested in hosting this or any event, please do! You can subscribe to this blog (see top of the right sidebar) to stay updated on this challenge. That’s it. Let’s enjoy reading for the 2012 Africa Reading Challenge. Thank you for the list. I have just begun reading African literature this month and would like to continue. I have not found this year’s challenge or schedule. Is there one? Hi Kinna, I would love to participate in the Africa Reading Challenge but I would also like to add a giveaway to make readers more involved. Is this allowed? Thanks. It’s June and I’m signing up!!! Im going to read the latest from my homeland Kenya:PRINCESS ADHIS AND THE NAIJJO COCA BRODA by Tony ‘Smitta’ Mochama and ONE DAY I WILL WRITE ABOUT THIS PLACE by Binyavanga Wainaina. After that,i will read something from the North,South,East and Central Africa. Great idea Kinna. Count the Paperworth Bookclub in. We intend to read 5 books from 5 different parts of Africa including one non-fiction. We would send our reviews as we progress. For a West Africa option, Please permit me to suggest our very own Tomorrow Died Yesterday by Chimeka Garricks :-). I think this is a really great idea. Count the Paperworth Bookclub in. We intend to read 5 books from 5 different parts of Africa and would endeavour to submit our reviews. Well done! I am in as well just a little late making it official! Great challenge! Thanks Kinna! Hey Kinna, finally signed up! Thanks for the inspiration/motivation. Thank you for this challenge, Kinna. I don’t think I’ve read any African literature, but I’m very interested in its various histories and cultures. I decided to give your novice reading list a shot, minus the ones I can’t get at my local library (Salih and Ba), plus the the African Literature staple by Achebe. For now, I’ve added Cutting for Stone, by Abraham Verghese, but I’m doubtful this one actually counts. So, my list is still possibly one book short – I’d like to add a west/north African novel – what would you recommend to someone with my level of experience that will likely be available in a Canadian library? Hi Kinna, just noticed this. I’m in – will do an ‘official’ sign up when I post at the end of March on my 52 books progress. I’ve already got two African titles on my list so I’m well on the way. I am among those who discovered your challenge through Alex’s blog, but only now did I manage to write a sign-up post. Thank you for hosting this! And on a completely different note, I love your blog’s header image! I’m a bit late to the party, but this challenge sounds really great so I’ve just signed up. I quite fancy including a non-fiction book in my 5 titles – I look forward to seeing what books everybody picks. This is definitely something I look forward to participating in. I haven’t read much African fiction since I left school and this challenge is just the thing I need to get me to seek out more African writers and also hopefully more Ugandan writers too. I have just put up my list. Though I have only put up the 5 required for the challenge there are others that I have marked for when I am done with ARC. Should be an interesting year. Now to the reading. Just seen your challenge. For your readers who are interested in reading novels from lesser-known African countries, they might look at my website http://themodernnovel.com/african/region.htm, where they will find reviews of books from Angola, Benin, Burkina Faso, Burundi, Cape Verde, CAR, both Congos, Equatorial Guinea, Gabon, Guinea, Guinea-Bissau, Lesotho, Liberia, Mali, Mauritius, Mozambique, Niger, Réunion, Rwanda, Sierra Leone, Somalia, Tunisia and /zambia, as well as the better-known countries. Sadly, many are not available in English. I’m so excited for this challenge! I’ve got my list up over at my blog… It looks very short, I might “cheat” and do more than 5 books 🙂 Looking forward to reading your reviews! i’ve just joined as well – very exciting! i can’t wait to see what other people are reading, and to develop my own list. i hope to surpass five, and luckily there is plenty of time in which to do so. thank you for posting this! Kinna, just to clarify, for this challenge, the fiction should be by AFRICAN authors, right? Just wondering as I’m making my lists. My classics book club is reading Heart of Darkness (shudder, I’m a bit afraid) but that’s not by an African, so it wouldn’t count? I have plenty others on my list, so I shouldn’t have a problem reading 5 in the whole year, but I just wanted clarification on that. I have posted my first review, of Noo Saro-Wiwa’s ‘Looking for Transwonderland’ here http://goo.gl/34fS6 I would love comments and indeed corrections! Who likes a challenge? Who loves to read? You? This will interest you. I know there is no way i can by pass this. I surely ought to. Just signed up! I’m very excited about this challenge (it’s my first one)! I am so into this! Glad you are joining this challenge. Five books for you is not hard at all at the enviable reading pace that you set. thanks for your support. Thanks for you offer of sharing your list of African literature. I will take you up on that. No pressure, I’m sure that you will read the 5 books given the even bigger challenge of reading 1 book per country. I’m awful with challenges! I sign up and forget all about them. But, I’ve got to give this one a try! I haven’t read African literature in quite a while and could use the nudge into a directed reading. I’m adding the blog to my Google Reader as following the many events you have planned will keep reminding me to read. And thanks so much for supporting the Birthday Party Pledge! And thank you for the Birthday Party Pledge. I do hope that you join the challenge. All the best. I’m taking up the challenge; it’ll give me a good reason to read some Lusophone African literature. Great! Lately, African lit is becoming synonymous with Anglophone African writing so I’m pleased to see us being more inclusive. Enjoy. I’m certainly in. I love it when a challenge matches with goals you already have for yourself! 🙂 I built up quite a significant TBR shelf of African fiction and non-fiction last year and thank goodness otherwise my determination only to read from the TBR would thwart my joining in. As it is I have over 15 books to choose from. I’ll post about them soon. Fantastic! Love it when we use challenges to clear our TBRs. Looking forward to your list. I am so excited about this challenge. Thanks for this. I saw your divine North Africa reading list. Enjoy! Thanks for putting this together. I like you encouragement to read books by Africans. I have some ideas about the books I intend to read, but not a real list. My overall interests are in reading books by and about women from all over the globe. In the past I have read and Joys of Motherhood, by Buchi Emecheta and will probably read one of her books. a Nigerian read. Other bloggers have may trying to get and read something of Chimamanda Ngozi Adichie, another Nigerian. Basically I look forward to the suggestions of you and others for guidance about other books. There will be lots of suggestions so brace yourself! thanks for considering the challenge. I am definitely participating and will be postiong about this. Very excited. My choices may not be all that original, since I haven’t read many books from African authors (I haven’t even read Things Fall Apart *hides in shame*), but I do have some exciting choices on my shelves and I’m sure this will lead to many more recommendations! Oh don’t feel too bad, Iris. I’ve never read Achebe either! I did check it out to lots of students assigned it in undergrad though (during my first library gig). Don’t worry about Things Fall Apart. It’s just what most people read when they do read African lit. I hope you do get to The Memory of Love though. I see it’s on your TBR. I think this is awesome. I’m have over committed on number of challenges, but this one really sounds like up my alley. If by fluke I am close to reading 5 African books, I’ll sign-up and post my review at one go! I was hoping you would take the bait and not leave Africa out of the challenges that you do this year! This sounds great. I will definitely join, and do all the things I am supposed to – actually my TBR shelves are definitely calling for something like a challenge! Oh good, Nina. Otherwise, I’d call you out at the next BloggingGhana meeting :). Thanks for the support. I’m in. This shall be fun. Anyone have any good resources for African literature from different regions. I’m primarily interested in Central and West Africa. I’ll post a list on Central Africa soon. Amy of Amy Reads has quite the database of Nigerian literature. Do check out her blog. I’m in! I like the flexibility of this, and 5 books is a perfect way to entice me 🙂 I’ll add my post/link in a bit. I thought it was crucial to make it flexible since there is so much to explore in African lit. No, that is not cheating at all. What would we do without overlaps in challenges? I saw your goal to read Kenyan authors prior to announcing the challenge. It made me smile. Beautiful idea! I’ve already made my list (subject to change) and posted about the challenge. This is the first challenge in 2012 that I’ve committed to! Thanks! You are most welcome. Enjoy your reading. Count me in. Though I must say that finding books from the Lusophone and Arabic list will be a bit difficult. I’ll search around. I found quite a number of Lusophone lit at EPP books. They tend to have Mia Couto and Pepetela. I’m definitely in. I am a big fan of African writers. Thank you Alex for letting me know. I’m grateful to Alex for promoting the challenge and bringing you here. Enjoy the challenge. I *don’t* want anymore challenges for this year. Really I don’t! As I said on twitter a few weeks (months? I don’t remember) ago when you were talking about this challenge I’m very interesting in reading more African lit. So I will sign up. Absolutely! I’m glad I presented a challenge which you could not ignore! Kinna, I’m in! The plan is to do only Portuguese-speaking African countries. Since the challenge is 5 books and there are 5 such countries, it seems perfect. I’ve seen your list and it comprehensively covers Lusophone African lit. Thanks for participating. Mel, thanks for the suggestion. I will amend the requirement soon to incorporate your ideas. I GOTTA sign up !! Thank you, Maphead. I know your list will be eclectic and interesting. Yes, count me in! I’ll write an official sign up post shortly. I was hoping you would join :). Enjoy your books. As you know, I am beyond excited for this 🙂 Will start writing up my post now. Can’t wait to go home and peruse my shelves and decide exactly which books to read. I know for sure I want to explore more Lusophone and Francophone African lit. I am excited too. You would think with the amount of African lit that we read that the excitement would be tempered! Looking forward to your list. I swore I wouldn’t get involved in any reading challenges this year, but I can’t resist this one. I’m going to read some of my African TBR which includes half a dozen Andre Brinks and one by Nadine Gordimer, plus The Cry of Winnie Mandela by Njabulo Ndebele, Ake by Wole Soyinka, Ways of Dying by Zakes Mda, A Blade of Grass by Lewis deSoto, Bitter Fruit by Achmat Dangor, and The Concubine by Elechi Amadi. I’ve got some short stories from African Roar on my Kindle too. I’ll try and organise my reading so that I read and review the Ghanian and Nigerian ones at the right time. Thanks for hosting this, Kinna! That is quite a lit. And I like the concentration in South African Literature; I hope to do something similar with my list. Thanks for participating. Enjoy your reading. What Nadine Gordimer book are you reading? How is your challenge reading going? Hi Cathy, the Nadine Gordimer is July’s People, but I’m not going to read that one next. The plan is (vaguely) to read one per month from what I have on my TBR, but to try to read he authors I don’t know first. So since I’ve already read Gordimer’s The Conservationist, I probably won’t get to that for a while. I’ll definitely be doing this one. Thanks for the support and enjoy your books. Lifelong reader. I read mostly fiction. I enjoy world literature. I’m partial to women writers, especially African women writers. Here, you'll find commentary on novels, short stories and poems. In Accra, Ghana. Contact me at kinnareads at gmail dot com. Host of Africa Reading Challenge.